Accidents involving commercial vehicles and trucks can lead to complex litigation involving businesses, insurance companies, multiple defendants, and federal trucking regulations. If you have been injured in a trucking accident, you want to be certain that your attorney is adept in handling the complexities of trucking litigation. Our team of New York City trucking accident attorneys will work to obtain optimal results in your case. Large loads, dangerous products, and other dangerous conditions can lead to catastrophic and fatal accidents involving semis and other large commercial vehicles. If you have been injured in a trucking accident, it is imperative that you contact a NYC trucking accident lawyer as soon as possible. Our attorneys will immediately begin work on your case to ensure that necessary evidence, including witness statements, black box recording evidence, and driver’s log records are preserved. We will work to protect your financial security and your interests now and into the future. Large trucks traveling at high speeds with heavy cargo can easily cause serious injuries and wrongful death when drivers are reckless, cargo loaders are careless or owners are negligent. Because of the inherent risk in transporting cargo, in NYC carriers are generally required to carry large amounts of insurance. This ensures that accident victims have access to the compensation they need following serious injuries. If you or a loved one has been injured in a commercial truck accident, contact the New York City commercial truck accident attorneys of The Orlow Firm. 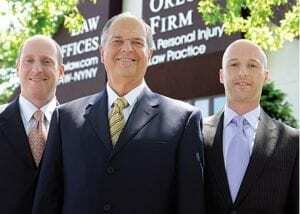 We have represented clients in truck accidents since 1981. In too many cases in New York City, our investigations reveal that the negligent truck drivers only recently received their commercial driving licenses (CDLs) and are “learning on the road.” Other common problems include poorly maintained trucks, or drivers with a history of traffic violations and drunk driving. If you have been injured in a commercial truck accident, do not risk losing the compensation you deserve.